Received: July 6, 2018; Revised: September 11, 2018; Accepted: September 12, 2018; Published online: December 15, 2018. The rising incidence of early gastric cancer has enabled the development of function-preserving gastrectomy with the focus on post gastrectomy quality of life and adherence to sound oncologic principles. It is concurrent with the growing popularity of minimally invasive surgery; and both are commonly used together. The different kinds of function-preserving gastrectomy included in this review are: pylorus-preserving and proximal gastrectomy, vagus nerve preservation, sentinel node navigation, and various endoscopic & minimally-invasive techniques. In this article the indications, techniques, oncologic safety, functional benefit, and outcomes of each kind of function-preserving gastrectomy are discussed. The proportion of early gastric cancer (EGC) in East Asia has been increasing due to the implementation of screening programs in South Korea and Japan. In 2014, Stage I gastric cancers comprised 63.9% of all patients who received surgical treatment for gastric cancer in South Korea.1 This made the prognosis for majority of gastric cancer patients favorable and thus the shift of focus on quality of life post gastrectomy is inevitable. Function-preserving gastrectomy (FPG) was developed to prevent post-gastrectomy syndromes experienced after conventional radical gastrectomy. It is characterized by a less radical but curative resection that maintains the reservoir and mixing/grinding functions of the stomach, as well as its endocrine and metabolic function. It is concurrent with the popularity of laparoscopic surgery and thus are used in combination in some centers. In this review article, the various types of FPG will be discussed which are: pylorus-preserving gastrectomy, proximal gastrectomy, vagus nerve-preserving gastrectomy, sentinel node navigation surgery, and endoscopic resection (EMR, ESD, LECS, CLEAN-NET, NEWS). According to the Japanese gastric cancer treatment guidelines, 3 PPG can be considered for the treatment of clinical T1 N0 M0 gastric cancers in the middle portion of the stomach with distal tumor border at least 4 cm proximal to the pylorus. The standard technique of pylorus preservation is comprised of preservation of the hepatic branch of the vagus nerve and the infra-pyloric vessels, with some minor variation among surgeons.4 This maintains the innervation, blood supply, and venous drainage of the pylorus. D1/D1+ lymphadenectomy is recommended for cT1N0 gastric cancer patients according to the Japanese Gastric Cancer Guidelines, which for PPG, comprises dissection of lymph nodes station 1, 3, 4sb, 4sd, 6, & 7 for D1 and inclusion of 8a & 9 for D1+.3 Suprapyloric lymph node dissection is omitted to preserve the right gastric vessels and hepatic branch of the vagus, which has been considered a pitfall of PPG.5 However, a Japanese study reported a 0.2% rate of metastases to the suprapyloric lymph nodes in T1 cancers in the middle one–third of the stomach.6 CT scan and endoscopic ultrasound are commonly used pre-operatively to ascertain accuracy of the diagnosis of cT1N0 cases who are candidates for PPG. In a study using quality-of-life questionnaires PPG was found-out to have significantly lower scores in diarrhea and dumping syndrome compared to DG.7 A meta-analysis8 involving 1,213 patients found PPG to be a preventive factor of dumping syndrome, bile reflux, gastritits, and gallstone formation, while proving to be beneficial in weight regain. The 5-year survival rate of patients who underwent PPG was 98% in a study by Hiki et al.11 Comparing laparoscopy–assisted PPG to laparoscopy-assisted DG, Suh et al.12 reported a similar 3-year recurrence-free survival rate of 98.2% vs 98.8%, respectively. A meta-analysis by Xiao et al.8 showed a similar 5-year survival rate of PPG vs DG. The use of laparoscopy in function-preserving gastrectomy has gained interest and popularity in the recent years. Laparoscopy-assisted PPG has been established as a feasible and safe procedure with reduced blood loss, pain, and faster recovery compared with open PPG.13 Anastomosis can be easily performed from a small upper abdominal incision directly above the anastomosis site (Fig. 1). A multicenter randomized controlled trial comparing laparoscopic PPG vs laparoscopic DG (KLASS 04-Korean laparoscopic Gastrointestinal Surgery Study) is on-going in South Korea. It will primarily investigate the incidence of dumping syndrome, as well as the relapse-free & overall survival, morbidity, mortality, QOL, and other secondary outcome measures. Totally laparoscopic PPG has also been reported, although a longer operative time is required compared to laparoscopy-assisted PPG.14 Anastomosis is done using intracorporeal delta-shaped anastomosis and a combination of stapler & handsewn procedures.2 Confirming the tumor location by use of pre-operative placement of marking clips and intraoperative gastroscopy has ensured the oncologic safety of this procedure. The incidence of cancer in the upper third of the stomach is steadily rising. In 2014, there were 2,365 (16%) cases of cancers in the upper third of the stomach treated with surgery in South Korea, a 2.6% increase from 2009.1 In congruence with the growth of the proportion of EGC, laparoscopic PG is the best theoretical treatment option for proximal EGC and outweighs open PG, open total gastrectomy (TG), and laparoscopic TG.17 Quality of life may be improved with PG due to the preservation of the function of the distal stomach along with the pyloric ring.9 However, PG is not a popular surgical choice, with only 1.1% (168) of all gastrectomy cases done in South Korea at 2014.1 This is probably due to three main concerns with PG: functional benefits, oncological safety, and anastomosis-related complications. These will be discussed in the succeeding text. The Japanese gastric cancer treatment guidelines 2014 (ver 4) recommends that PG can be considered for cT1N0 proximal gastric tumors where more than half of the distal stomach can be preserved; and D1/D1+ lymphadenectomy for cT1N0 tumors comprising lymph nodes 1, 2, 3a, 4sa, 4sb, & 7 for D1; with the inclusion of 8a, 9, & 11p for D1+.3 The distal stomach is preserved along with its blood supply (right gastric and right gastroepiploic vessels) and innervation (distal branches of the vagus nerve). Many studies report conflicting benefit of PG compared to TG in terms of nutrition status (serum protein, albumin, and cholesterol), body weight, and anemia.18–21 However, long-term follow-up data have shown that hemoglobin levels in PG are significantly higher than in TG, which is reflected in the lower requirement for vitamin B12 supplementation after PG compared to TG.22 Takiguchi et al.23 reported improved quality of life in terms of weight loss, necessity of additional meals, diarrhea, and dumping in patients who underwent open PG vs open TG. The oncologic safety of PG is questioned due to the omission of dissection of lymph node stations 5 and 6 plus the potential of remnant stomach cancer. However, lymph node metastasis in EGC are estimated to be at 10~20%. Additionally, Kong et al.24 reported that proximal EGC only metastasize to LN stations 2, 3, and 7. And Kitamura et al.25 did not observe LN metastasis on the lower stomach among proximal gastric cancers confined to the muscularis propia (T2). Few studies have compared laparoscopic PG to open PG. Kinoshita et al.32 reported that laparoscopic PG has a longer operative time but decreased blood loss, and similar complication rates compared to open PG. The most important technical challenge in laparoscopic PG is the reconstruction method, which is still not well established.33 Ahn et al.33 reported a case series on laparoscopic PG using DTR and showed that it is a feasible, simple, and useful reconstruction method with excellent postoperative outcomes in terms of reflux symptoms (Fig. 2). An on-going multicenter, prospective Phase III trial (KLASS 05) in South Korea aims to compare laparoscopic PG with DTR and laparoscopic TG, with hemoglobin change at 2 years post-gastrectomy and vitamin B12 cumulative supplement quantity as the primary endpoint. Single-port laparoscopic PG with DTR has been reported by Lee et al.34 Despite the technical challenge caused by poor ergonomics, it provided cosmetic benefit and a good quality of life for the patient. The use of Robotics in a few cases of PG has been reported as part of general use of robotics in gastrectomy.15 There are no specific reports on the benefit of robotics in PG. For preservation of the hepatic branch, the lesser omentum should be divided below the nerve. During dissection of the common hepatic artery lymph nodes, the hepatic nerve plexus should be identified and preserved.36 The posterior trunk of the vagus nerve and its branches lie within the gastropancreatic peritoneal fold. Ando et al.35 identified three types of variations in the course of the celiac branch depending on its relationship to the left gastric artery, and found that 81.8% had the celiac branch lay closer to the artery than to the crus. Preservation of the celiac branch entails meticulous dissection when isolating the left gastric artery (Fig. 3). The benefits of VNPG are seen in the superior recovery of body weight and reduction in the incidence of gallstone development.35 A randomized controlled trial37 in South Korea comparing vagus nerve-preserving distal gastrectomy to conventional gastrectomy showed significantly less diarrhea and appetite loss at 12 months with vagus nerve preservation. There was no difference in the long-term clinical complications, recurrence, and survival. The Japanese Society of Sentinel Node Navigation Surgery45 analyzed 397 patients with cT1-2N0M0 gastric cancers with <4 cm tumor size. They perfomed SN mapping and identification followed by standard gastrectomy with D2 lymphadenectomy. The detection rate, sensitivity, and accuracy of SN examination were 97.5% (387/397), 93% (53/57), and 99% (383/387), respectively. False-negative rate was only 1% (four patients). Their work also suggested that lymphatic basin based surgery (sentinel lymph node and downstream lymphatic flow) may be recommended due to findings of metastatic nodes in only the lymphatic basin of some cases with negative SNs. Endoscopic resection is considered for tumors that have a very low possibility of lymph node metastasis and are suitable for en-bloc resection. Some are used as primary tumor control for SNNS. The two most frequently used methods of endoscopic resection are Endoscopic mucosal resection (EMR) and Endoscopic submucosal dissection (ESD). The Japanese gastric cancer treatment guidelines3 state that EMR or ESD is indicated as a standard treatment for gastric adenocarcinoma of the differentiated-type without ulcerative findings, of which the depth of invasion is clinically diagnosed as T1a and the diameter is ≤2 cm. Expanded indications have also been described but are considered investigational. While in ESD, the mucosa surrounding the lesion is circumferentially incised using a high-frequency electric knife and the submucosal layer is dissected from the proper muscle layer.3 The size limitation in EMR is addressed by ESD and is considered superior to EMR because it enables precise pathologic T staging for large EGC.46 In a recent metaanalysis,47 ESD was shown to have advantages in en bloc resection, histologically complete resection, and local recurrence rate compared to EMR. Although mean operation time and complications such as perforation was higher in the ESD technique. Hahn et al.48 found that ESD had lower acute complication rates compared to surgery (8.1% vs 18.1%) but had similar 5 year-overall survival (96.4% vs 97.2%) and disease-specific survival rate (99.6% vs 99.2%). However, the annual incidence of recurrence was 2.18% in ESD and 0.19% in the surgery group. Function-preserving gastrectomy has revolutionized treatment for early gastric cancer. The more popular types and techniques have been discussed in this review article and quite a few more are currently being developed with the advancement of skills & technology. There are important matters that have to be addressed in function-preserving gastrectomy, which are: oncologic safety, actual functional benefit for patients, proper selection of patients, availability and expertise in the use of new technique and equipment including laparoscopy and robotics. Fig. 1. 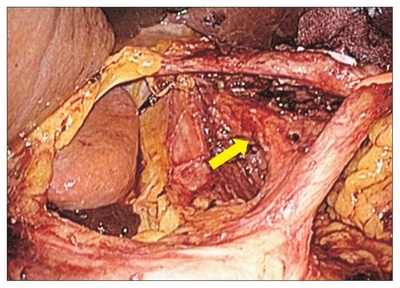 Gastro-gastric anastomosis after laparoscopic pylorus-preserving gastrectomy. Fig. 2. 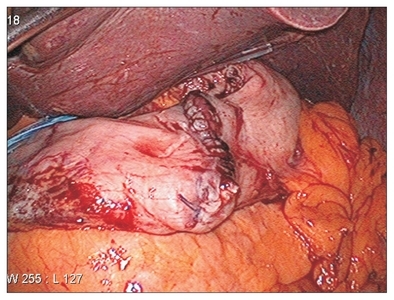 Laparoscopic proximal gastrectomy with double tract reconstruction which comprises esophago-jejunostomy, gastro-jejunostomy and jejunojejunostomy. Fig. 3. Vagus nerve-preserving gastrectomy. Hepatic and celiac branches are identified and preserved during the surgery. Information Committee of Korean Gastric Cancer Association (2016). Korean Gastric Cancer Association Nationwide Survey on Gastric Cancer in 2014. J Gastric Cancer. 16, 131-140. Nunobe, S, and Hiki, N (2017). Function-preserving surgery for gastric cancer: current status and future perspectives. Transl Gastroenterol Hepatol. 2, 77. Japanese Gastric Cancer Association (2017). Japanese gastric cancer treatment guidelines 2014 (ver. 4). Gastric Cancer. 20, 1-19. Shibata, C, Saijo, F, and Kakyo, M (2012). Current status of pylorus-preserving gastrectomy for the treatment of gastric cancer: a questionnaire survey and review of literatures. World J Surg. 36, 858-863. Oh, SY, Lee, HJ, and Yang, HK (2016). Pylorus-Preserving Gastrectomy for Gastric Cancer. J Gastric Cancer. 16, 63-71. Fujita, J, Takahashi, M, and Urushihara, T (2016). Assessment of postoperative quality of life following pylorus-preserving gastrectomy and Billroth-I distal gastrectomy in gastric cancer patients: results of the nationwide postgastrectomy syndrome assessment study. Gastric Cancer. 19, 302-311. Xiao, XM, Gaol, C, Yin, W, Yu, WH, Qi, F, and Liu, T (2014). Pylorus-Preserving versus Distal Subtotal Gastrectomy for Surgical Treatment of Early Gastric Cancer: A Meta-Analysis. Hepatogastroenterology. 61, 870-879. Hiki, N, Nunobe, S, Kubota, T, and Jiang, X (2013). Function-preserving gastrectomy for early gastric cancer. Ann Surg Oncol. 20, 2683-2692. Nakane, Y, Michiura, T, Inoue, K, Sato, M, Nakai, K, and Yamamichi, K (2002). Length of the antral segment in pylorus-preserving gastrectomy. Br J Surg. 89, 220-224. Hiki, N, Sano, T, Fukunaga, T, Ohyama, S, Tokunaga, M, and Yamaguchi, T (2009). Survival benefit of pylorus-preserving gastrectomy in early gastric cancer. J Am Coll Surg. 209, 297-301. Suh, YS, Han, DS, and Kong, SH (2014). Laparoscopy-assisted pylorus-preserving gastrectomy is better than laparoscopy-assisted distal gastrectomy for middle-third early gastric cancer. Ann Surg. 259, 485-493. Nunobe, S, Hiki, N, and Fukunaga, T (2007). Laparoscopy-assisted pylorus-preserving gastrectomy: preservation of vagus nerve and infrapyloric blood flow induces less stasis. World J Surg. 31, 2335-2340. Kumagai, K, Hiki, N, and Nunobe, S (2015). Totally laparoscopic pylorus-preserving gastrectomy for early gastric cancer in the middle stomach: technical report and surgical outcomes. Gastric Cancer. 18, 183-187. Kim, HI, Han, SU, and Yang, HK (2016). Multicenter Prospective Comparative Study of Robotic Versus Laparoscopic Gastrectomy for Gastric Adenocarcinoma. Ann Surg. 263, 103-109. Han, DS, Suh, YS, and Ahn, HS (2015). Comparison of Surgical Outcomes of Robot-Assisted and Laparoscopy-Assisted Pylorus-Preserving Gastrectomy for Gastric Cancer: A Propensity Score Matching Analysis. Ann Surg Oncol. 22, 2323-2328. Jung, DH, Ahn, SH, Park, DJ, and Kim, HH (2015). Proximal Gastrectomy for Gastric Cancer. J Gastric Cancer. 15, 77-86. An, JY, Youn, HG, Choi, MG, Noh, JH, Sohn, TS, and Kim, S (2008). The difficult choice between total and proximal gastrectomy in proximal early gastric cancer. Am J Surg. 196, 587-591. Wen, L, Chen, XZ, and Wu, B (2012). Total vs. proximal gastrectomy for proximal gastric cancer: a systematic review and meta-analysis. Hepatogastroenterology. 59, 633-640. Kosuga, T, Ichikawa, D, and Komatsu, S (2015). Feasibility and Nutritional Benefits of Laparoscopic Proximal Gastrectomy for Early Gastric Cancer in the Upper Stomach. Ann Surg Oncol. 22, S929-935. Son, MW, Kim, YJ, Jeong, GA, Cho, GS, and Lee, MS (2014). Long-Term Outcomes of Proximal Gastrectomy versus Total Gastrectomy for Upper-Third Gastric Cancer. J Gastric Cancer. 14, 246-251. Yoo, CH, Sohn, BH, Han, WK, and Pae, WK (2005). Proximal gastrectomy reconstructed by jejunal pouch interposition for upper third gastric cancer: prospective randomized study. World J Surg. 29, 1592-1599. Takiguchi, N, Takahashi, M, and Ikeda, M (2015). Long-term quality-of-life comparison of total gastrectomy and proximal gastrectomy by postgastrectomy syndrome assessment scale (PGSAS-45): a nationwide multi-institutional study. Gastric Cancer. 18, 407-416. Kong, SH, Kim, JW, Lee, HJ, Kim, WH, Lee, KU, and Yang, HK (2010). Reverse double-stapling end-to-end esophagogastrostomy in proximal gastrectomy. Dig Surg. 27, 170-174. Kitamura, K, Yamaguchi, T, and Nishida, S (1997). The operative indications for proximal gastrectomy in patients with gastric cancer in the upper third of the stomach. Surg Today. 27, 993-998. Pu, YW, Gong, W, Wu, YY, Chen, Q, He, TF, and Xing, CG (2013). Proximal gastrectomy versus total gastrectomy for proximal gastric carcinoma. A meta-analysis on postoperative complications, 5-year survival, and recurrence rate. Saudi Med J. 34, 1223-1228. Tokunaga, M, Ohyama, S, and Hiki, N (2008). Endoscopic evaluation of reflux esophagitis after proximal gastrectomy: comparison between esophagogastric anastomosis and jejunal interposition. World J Surg. 32, 1473-1477. Katsoulis, IE, Robotis, JF, Kouraklis, G, and Yannopoulos, PA (2006). What is the difference between proximal and total gastrectomy regarding postoperative bile reflux into the oesophagus?. Dig Surg. 23, 325-330. Zhao, P, Xiao, SM, Tang, LC, Ding, Z, Zhou, X, and Chen, XD (2014). Proximal gastrectomy with jejunal interposition and TGRY anastomosis for proximal gastric cancer. World J Gastroenterol. 20, 8268-8273. Katai, H, Morita, S, Saka, M, Taniguchi, H, and Fukagawa, T (2010). Long-term outcome after proximal gastrectomy with jejunal interposition for suspected early cancer in the upper third of the stomach. Br J Surg. 97, 558-562. Nakamura, M, Nakamori, M, and Ojima, T (2014). Reconstruction after proximal gastrectomy for early gastric cancer in the upper third of the stomach: an analysis of our 13-year experience. Surgery. 156, 57-63. Kinoshita, T, Gotohda, N, Kato, Y, Takahashi, S, Konishi, M, and Kinoshita, T (2013). Laparoscopic proximal gastrectomy with jejunal interposition for gastric cancer in the proximal third of the stomach: a retrospective comparison with open surgery. Surg Endosc. 27, 146-153. Ahn, SH, Jung, DH, Son, SY, Lee, CM, Park, DJ, and Kim, HH (2014). Laparoscopic double-tract proximal gastrectomy for proximal early gastric cancer. Gastric Cancer. 17, 562-570. Lee, CM, Park, DW, and Jung, DH (2016). Single-Port Laparoscopic Proximal Gastrectomy with Double Tract Reconstruction for Early Gastric Cancer: Report of a Case. J Gastric Cancer. 16, 200-206. Ando, S, and Tsuji, H (2008). Surgical technique of vagus nerve-preserving gastrectomy with D2 lymphadenectomy for gastric cancer. ANZ J Surg. 78, 172-176. Kojima, K, Yamada, H, Inokuchi, M, Kawano, T, and Sugihara, K (2008). Functional evaluation after vagus-nerve-sparing laparoscopically assisted distal gastrectomy. Surg Endosc. 22, 2003-2008. Kim, SM, Cho, J, and Kang, D (2016). A Randomized Controlled Trial of Vagus Nerve-preserving Distal Gastrectomy Versus Conventional Distal Gastrectomy for Postoperative Quality of Life in Early Stage Gastric Cancer Patients. Ann Surg. 263, 1079-1084. Park, JY, Kim, YW, and Ryu, KW (2016). Assessment of laparoscopic stomach preserving surgery with sentinel basin dissection versus standard gastrectomy with lymphadenectomy in early gastric cancer-A multicenter randomized phase III clinical trial (SENORITA trial) protocol. BMC Cancer. 16, 340. Valsecchi, ME, Silbermins, D, de Rosa, N, Wong, SL, and Lyman, GH (2011). Lymphatic mapping and sentinel lymph node biopsy in patients with melanoma: a meta-analysis. J Clin Oncol. 29, 1479-1487. Veronesi, U, Paganelli, G, and Viale, G (2003). A randomized comparison of sentinel-node biopsy with routine axillary dissection in breast cancer. N Engl J Med. 349, 546-553. Mansel, RE, Fallowfield, L, and Kissin, M (2006). Randomized multicenter trial of sentinel node biopsy versus standard axillary treatment in operable breast cancer: the ALMANAC Trial. J Natl Cancer Inst. 98, 599-609. Symeonidis, D, Koukoulis, G, and Tepetes, K (2014). Sentinel node navigation surgery in gastric cancer: Current status. World J Gastrointest Surg. 6, 88-93. Arigami, T, Uenosono, Y, and Yanagita, S (2017). Clinical application and outcomes of sentinel node navigation surgery in patients with early gastric cancer. Oncotarget. 8, 75607-75616. Park, JY, Ryu, KW, and Eom, BW (2014). Proposal of the surgical options for primary tumor control during sentinel node navigation surgery based on the discrepancy between preoperative and postoperative early gastric cancer diagnoses. Ann Surg Oncol. 21, 1123-1129. Kitagawa, Y, Takeuchi, H, and Takagi, Y (2013). Sentinel node mapping for gastric cancer: a prospective multicenter trial in Japan. J Clin Oncol. 31, 3704-3710. Ko, WJ, Song, GW, Kim, WH, Hong, SP, and Cho, JY (2016). Endoscopic resection of early gastric cancer: current status and new approaches. Transl Gastroenterol Hepatol. 1, 24. Facciorusso, A, Antonino, M, Di Maso, M, and Muscatiello, N (2014). Endoscopic submucosal dissection vs endoscopic mucosal resection for early gastric cancer: A meta-analysis. World J Gastrointest Endosc. 6, 555-563. Hahn, KY, Park, CH, and Lee, YK (2018). Comparative study between endoscopic submucosal dissection and surgery in patients with early gastric cancer. Surg Endosc. 32, 73-86. Goto, O, Takeuchi, H, Kitagawa, Y, and Yahagi, N (2016). Hybrid surgery for early gastric cancer. Transl Gastroenterol Hepatol. 1, 26. Abe, N, Mori, T, and Takeuchi, H (2008). Successful treatment of early stage gastric cancer by laparoscopy-assisted endoscopic full-thickness resection with lymphadenectomy. Gastrointest Endosc. 68, 1220-1224.